For more than 40 years since it first introduced LNG to Japan in 1969, the Tokyo Gas Group has worked to establish and advance its LNG value chain in an effort to spread and expand the use of natural gas, which excels in environmental soundness and supply security. The benefits of using LNG as a feedstock for city gas are as follows. LNG is produced by cooling natural gas, which is primarily composed of methane, to its liquid state. Methane is a gas at zero degrees Celsius under one atmospheric pressure and changes into a liquid when cooled to 162 degrees below zero Celsius, its cubic volume diminishing by six hundred times. Using this property to transport natural gas in the form of LNG on carriers allows for the transport and use of massive volumes of natural gas in regions where it cannot be delivered via pipelines. LNG is a clean source of energy without any hazardous substances such as SOx. 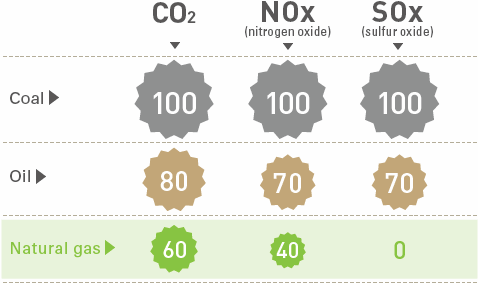 When burned, it produces 20% to 40% less CO2 compared to oil, coal and other fossil fuels. The abundance of natural gas reserves around the world ensures a stable supply of raw material, which is fundamental to providing a long-term supply of city gas to customers. Also, the calorific value of city gas produced from LNG today is 2.15 times* higher than that of the gas initially produced and supplied by Tokyo Gas. This has increased our transport and storage capacity, enabling us to respond efficiently to any rise in demand. City gas using LNG as feedstock is produced by pouring seawater to vaporize LNG stored in a tank at minus 162°C and adjusting the calorific value. The process does not require large-scale manufacturing facilities, thereby keeping production costs down. After natural gas is vaporized to produce city gas at the LNG terminal, it is directly delivered to the point of consumption through pipelines, thus causing no loss due to energy conversion or transportation.